After yet another interesting week for Leicester boss Nigel Pearson which included a lecture from BBC journalist Pat Murphy about treating the media with respect, it was kind of Newcastle boss John Carver to help him out by taking the media’s spotlight away from Pearson and placing it on himself. After Newcastle’s capitulation against relegation threatened Leicester on Saturday, Carver decided to publicly name and shame his players in particular defender Mike Williamson who he suggested had deliberately got himself sent off. The centre back was dismissed for second bookable offence after a late challenge on Jamie Vardy with the ball and the player already over the sideline. The challenge was reckless and unnecessary with the ball running out of play for what was going to be Newcastle throw anyway. Williamson reacted quickly with a statement the next day denying the allegations and insisting there was no intent to get himself sent off. Williamson now faces a two match ban which means that he will only be available for selection for Newcastle’s final game of the season against West Ham. Many question whether or not he will play once more this season or indeed for Newcastle ever again with pundit Andy Townsend suggesting that he is struggling at this level. Williamson is joined on the sidelines by fellow defender Darryl Janmaat who too received his marching orders after two stupid challenges. The defeat marks Newcastle’s eighth straight loss and sees them slip to 15th in the table, two points above the relegation zone with one more game played than Hull in 16th and arch rivals Sunderland in 18th. Both sides face Arsenal in their additional match so three points is hardly a given but the situation for Newcastle could get a lot worse if they are to win and Newcastle can’t stop the rot. Nine points remain to secure their place in the Premiership next season but given their recent form it’s hard to see where they will pick any points up. 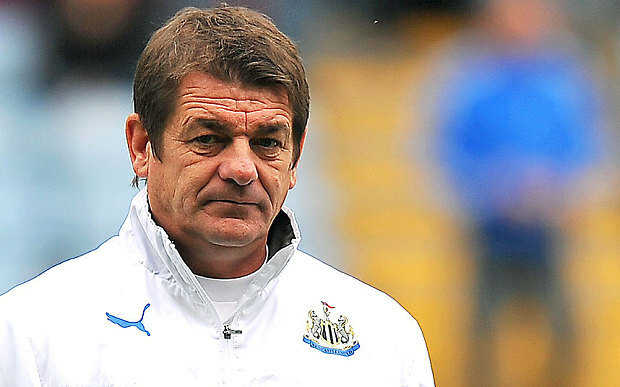 In a sensational post match interview, manager John Carver blasted his players for their lack of effort saying that only Jack Colback displayed the commitment and desire needed to pull themselves out of this dogfight. It was a stunning statement but yet another example of how out of his depth Carver is. If he hadn’t lost the dressing room before the Leicester defeat he will certainly have now with Williamson and Janmaat fronting a queue that will be knocking on his door today for answers. Newcastle’s tactics were wrong going into the game in particular at set pieces and that blame lies solely at the feet of the manager. Look at Leicester’s first goal after only 37 seconds of the match. A corner swung in from the left is met easily by Leo Ulloa who powers his header past Tim Krul in the Newcastle goal. Anyone watching the game would have spotted a series of major flaws in the way Newcastle was positioned in the run up to the corner being taking. To start with there was no one covering the front post, with only Jack Colback hovering at the back post. The penalty box was crowded with 6 Leicester players being marked by nine Newcastle players. With Janmaat man marking Cambassio at the back post and Guiterrez on Wasilewski at the front post, four Leicester players remained left to mark. Ryan Taylor quickly placed himself between Jamie Vardy and Tim Krul three yards off of the line whilst Paul Dummet picked up Morgan’s run towards the back post. That left Mike Williamson to track the run of Robert Huth whilst Riviere floated in the box. But the strangest decision was to leave Newcastle’s best header of the ball Coloccini as a spare in the 6 yard box whilst letting Sissoko man mark Leicester’s principle goal treat Ulloa. They paid the ultimate price as Ulloa leaped well above the French midfielder to head into the net. It was a similar story on Leicester’s second goal with Coloccini left spare rather than picking up a player. In the end it was an easy tap in for Morgan from the in swinging free kick by Albrighton. Carver has on a too frequent basis said that his tactics were not at fault but instead the players ability to execute on them was but Saturday’s performance and in particular the way they lost the three goals – two from set plays and one from the penalty spot shows that he is as much to blame as the players. Yes the team looks stripped of confidence and lacks the desire to win but Carver is not helping the situation by setting his team up to fail from the off then heavily criticizing them after it. If Newcastle is to stay up they need to act now by sacking Carver in favour of someone who can pull the team back together and get the three to six points needed to ensure safety. With Derby missing out on a playoff berth, Newcastle could bring forward their plans to bring in Steve McLaren with the former England boss perhaps more than willing to come in now to ensure he is managing in the Premiership next season with Newcastle rather than the Championship. Failure to act by owner Mike Ashley will see Newcastle relegated especially if the drowning Carver continues to press the self destruct button.